When Stetson University decided to build a welcome center on campus, university officials promised to build “an iconic, sustainable building” that would last for years to come. The Marshall & Vera Lea Rinker Welcome Center was named the 2017 Outstanding Sustainability Project in the state by the Florida Planning and Zoning Association. 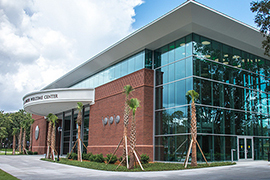 Stetson officials met more than five years ago with John Rinker, president of the Marshall and Vera Lea Rinker Foundation, who provided the lead gift to fund the construction of the building named in his parents’ honor. “When we were meeting with Mr. John Rinker, we made a commitment to him that we would build an iconic, sustainable building that would last 100 years,” recalled Al Allen, associate vice president for Facilities Management at Stetson. Last week, the Marshall & Vera Lea Rinker Welcome Center was named the 2017 Outstanding Sustainability Project in the state by the Florida Planning and Zoning Association. The state planning group cited many features in the building that conserve energy and water, make efficient use of land and help recharge groundwater supplies. “This award certifies that we did everything that we shared with Mr. Rinker,” said Allen, who traveled to Naples, Florida, to receive the award on Friday, June 9, along with Stetson Executive Vice President and Chief Financial Officer Bob Huth; Bob Lipscomb, CEO of the Williams Company, the general contractor; and Rob Gleason, Principle of Ro Jo Architecture, the firm that provided the design and engineering services. The Marshall & Vera Lea Rinker Welcome Center has glass walls to provide natural lighting, among other design features that conserve energy and water. In December 2016, the Rinker Welcome Center was recognized with the Outstanding Sustainability Initiative Award from the planning group’s local Surfcoast Chapter. For the state contest, the building competed against five others in the Sustainability category, said Helen LaValley, incoming FPZA state president, who oversaw the contest for the state planning awards. The Marshall & Vera Lea Rinker Welcome Center, for example, has glass walls that reduce the need for artificial lighting, a 50-year metal roof that reflects heat and helps keep the building cool, LED lighting inside requiring 75 percent less energy than traditional lighting, solar-powered lights to light the parking area, and a system where rainwater is directed into chambers providing time for the water to percolate into and help replenish the Floridan Aquifer. Also, it uses reclaimed water for irrigation and low-flow plumbing fixtures. The building received Green Globe Certification before it opened last fall. 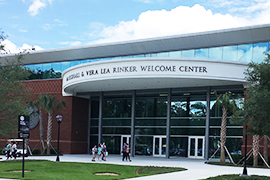 The three-story Marshall & Vera Lea Rinker Welcome Center houses Admissions and Enrollment Management, a “one-stop” service area with the Registrar, Bursar and Financial Planning, meeting rooms, and Career and Professional Development for students and alumni.